Well, look, I haven't fallen off the face of the earth. But it was a hot and busy weekend. The Open House with Dances With Wool at Chickasaw Farm was fun. It helped that before I got there I was able to get myself chilled completely. In spite of the heat, I had a great time. I even wove a few rows on the huge tri-loom. I put in a raffle ticket but I guess I didn't win. I haven't heard from my friends that I had the winning ticket. There were demo's of different crafts, and some vendors. 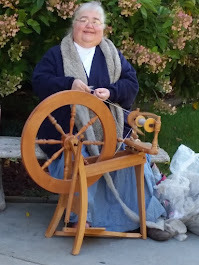 I didn't take my spinning wheel, but I did get one row of knitting done on my Tapestry Hitchhiker. After all it was World Wide Knit in Public Day. I got some wonderful wool for a shawl, and a nifty and inexpensive needle sizer. Some people lose tape measures. I lose needle sizers. I also bought a white Shetland fleece to be layered with a rose gray alpaca I had found in my wool room and sent them off for processing at Stonehenge Mills. I had to leave early from there, in time to get home for Mass, and then went on to the wedding reception with Hubby. Friends of the family, the groom was the younger of our matching sets of boys. Some of the groomsmen were familiar faces from the younger years. In spite of the heat, a great time was had. We even got a wagon ride back to the pond, where the wedding was held. We saw a bald eagle fly off from a log when we interrupted his fishing in the pond.